Malaria, dengue fever, Rift Valley fever, West Nile virus and Chikungunya are all mosquito-borne diseases. What can we do to control these insects capable of spreading viruses throughout entire regions? Emerging alternatives to aggressive solutions are increasingly relying on space-based tools. Culling livestock or eradicating mosquitoes across an entire region is a costly business and can sometimes have harmful effects. But less radical solutions are now proving their worth, in particular mitigation and near-real-time monitoring using early-warning systems. 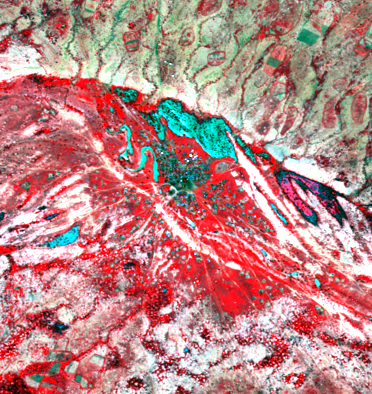 High-resolution SPOT 5 multispectral image of pools in the Ferlo region. Vegetation (red) is easily distinguished from wetlands (dark blue to cyan). Copyright : CNES 2003, Distribution Spot Image S.A.
For several years now, epidemiologists have been monitoring epidemics indirectly from space. Satellite imagery provides data about the environment of disease vectors (i.e., data on geography, meteorology and hydrology) rather than actual viruses, particularly in places where conditions are conducive to epidemics. High-resolution SPOT 5 imagery (2.5 to 10 m) is making a vital contribution to tele-epidemiology projects being led by CNES’s Exploitation and Applications department headed by Dr Antonio Güell. Medias-France*, a CNES affiliate, underpins the multidisciplinary efforts required for this type of study. A project focusing on Rift Valley fever (RVF) is a case in point. Its chief objective is to map areas where mosquitoes bearing RVF (Aedes vexans arabiensis and Culex poicilipes) proliferate. The study is concentrating on the Ferlo region of northeast Senegal, where these mosquitoes are abundant due to the presence and dynamics of temporary pools during the summer monsoon. These pools are where the mosquitoes lay their eggs and infect livestock and farmers. Pool dynamics are complex. Pools dry out from mid-October to June, then fill during the rainy season. Some pools are isolated whereas others are packed tightly together. Risk map of potential zones where Aedes vexans, the carrier of Rift Valley fever, might be present. Copyright : MEDIAS product, CNES 2003, Distribution Spot Image SA. Satellite imagery affords a number of advantages for tracking spatial and temporal variations. The SPOT 5 satellite can be tasked to acquire regular imagery of the same area and monitor changes. Using in-situ measurements of mosquito density and spread, scientists are able to establish risk maps of zones where mosquitoes are likely to be**. These maps can then be put into the hands of authorities responsible for early-warning systems, mosquito eradication and land planning. * A public interest grouping bringing together CNES, the IRD development research institute, Météo France, Paul Sabatier University in Toulouse, CLS, Spot Image and the CNRS national scientific research centre. ** J. P. Lacaux, Y. M. Tourre, C. Vignolles, J. A. Ndione, M. Lafaye, 2006: Classification of Ponds from High Spatial Resolution Remote Sensing: Application to Rift Valley Fever Epidemics in Senegal. Remote Sensing Of Environment. Elsevier Pub. doi:10.1016.rse.2006.07.12.